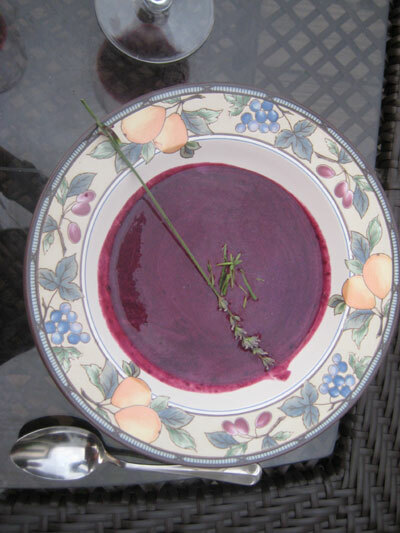 My friend Patti made this soup and garnished it with lavender from the garden. She said it turned out fabulous. It is packed with healthy antioxidants and since it's served chilled, it's perfect for Summer. 1) Stir together fresh blueberries, lemon juice, and 3/4 cup cold water in a 3-qt. saucepan. Bring to a boil; reduce heat, stir in dried lavender, and simmer, stirring occasionally, 5 minutes or until blueberries burst. 2) Remove from heat, and cool 5 minutes. Stir in vanilla extract. 3) Put mixture into blender to blend up the plup to make more liquid. Stir in yogurt. Cover and chill 4 to 24 hours.